Ingredients: Safflower Seed, Oat Groats, Millet Seed, Shelled Peanuts, Cracked Corn, Heat Processed Corn, Buckwheat, Wheat, Sunflower Seed, Grain Sorghum, Non-Viable Hemp Seed, Cashews, Almonds, Walnuts, Raisins, Dried Apricots, Ground Mollusk Shell, Kibbled Biscuit Made With Wheat Meal, Corn Meal, Soy Bean Meal, Bean Meal, Water, Shredded Coconut, Brazil Nuts, Whole Eggs, Bone Meal, Fresh Meat, Fresh Poultry Meat, Fresh and Dehydrated: Carrots, Dandelions, Chicory, Kale, Bananas, Apples, Oranges, Pears, Fresh Fish, Milk, Honey, Corn Syrup Solid, Casein, Salt, Brewers Yeast, Yellow Beta Carotene, Cod Liver Oil, Wheat Germ Oil, Dextrose, Vitamin A Supplement, Vitamin D3 Supplement, Vitamin B12 Supplement, Riboflavin Supplement, Niacin Supplement, Calcium Pantothenate, Choline Biotin, Ascorbic Acid, Manganese Sulfate, Zinc Sulfate, Ferrous Sulfate, Copper Sulfate, Ethylene Diamine Dihydriodide, Cobalt Sulfate, Magnesium Sulfate, Potassium Iodide, Vitamin E Supplement, Calcium Carbonate, Calcium Propionate, and Artificial and Natural Color and Flavor. Feeding Instructions For Small Hookbills: Feed ABBA 2200 to the birds two or three times a week, preferably in a deep dish. 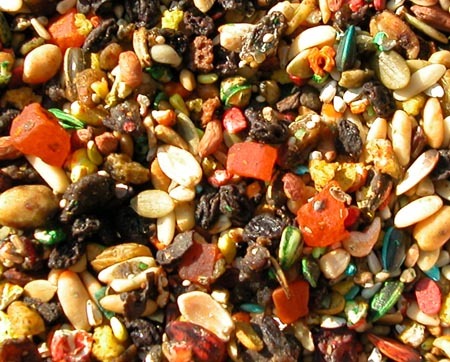 If ABBA 2200 is supplied properly to the birds, they will consume it with little or no waste. Do not mix ABBA 2200with any other dry seed.